After her first day on the job learning to stamp mail with a machine in April 1951, Nancy Pfeiffer was young, rebellious and ready to quit the insurance company that she wound up loving too much to leave. On that first day, her co-workers, in their 30s and 40s, seemed too old. At 18, she couldn't relate. Her mother insisted she go back. Now, 55 years later, Pfeiffer, who went from supervising the filing department to scanning records into a computer, imagines her mother watching from heaven. 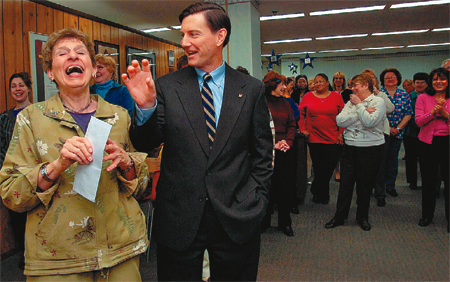 "I bet she's laughing up there," Pfeiffer, 73, said Monday after a company celebration of lemon filled cake and congratulations for being the longest serving employee among the 350 now working at the offices of Merchants Insurance Group in downtown Buffalo. She dabbed at tears when she saw the surprise crowd gathered in the cafeteria. To be so appreciated is overwhelming, she said. Company President Bob Zak praised her attitude, noting that she is well known for her cheerful greetings, and energy. Pfeiffer explained that the firm rewarded her with the things that one expert said are as important as pay for keeping employees -- respect, camaraderie, and the chance to advance. "Thanks for everything you've done for us. And we love you," Zak said. Two co-workers looked on at the cake cutting and said Pfieffer was unusual for staying so long, but the company has a way of keeping its employees happy for decades: 43 now working have from 25 to 38 years on staff. "They don't make you feel like you work for them. They make you feel like you work together," said Pat Armstrong, a claims department secretary with 35 years. For University at Buffalo management professor Jerry Newman, the news that Nancy Pfieffer had stayed for 55 years was amazing -- "I'm just shocked," he said. But, he said, the work force is split between people who keep their jobs for decades and those who move, having four or five jobs is an average. Some switch jobs to make more money. "Half the work force turns over regularly," said Newman, a specialist in human resources. "If you stay where you are you're going to get the 4 percent raises." According to a book Newman wrote called "Compensation," money is only one on a list of things that keep people happy. The others include job security, opportunity for advancement, a manageable work pace, and the social network. The Merchants Insurance Group has apparently delivered on those. The company, which was founded in Buffalo in 1918, sells car and property insurance to more than 100,000 policy holders through agents in nine states. Pfieffer, whose personal sparkle was matched by sparkly beaded flats, necklace and earrings, said she wasn't sure exactly what made her walk through the door 55 years ago and ask if they had openings. The friend who she'd been downtown shopping with waited outside while Pfieffer filled out an application. At the time she'd been out of high school for a year, dropping out of Amherst Central after three years. She wasn't good with money, so she didn't want a bank job. Insurance just seemed right, especially once she realized how nice her co-workers were. "They didn't stand over you and say, 'You better do this,' " she said. After spending most of her career filing, advising branch offices and streamlining the system that tracked all the insurance claims and customers, she worried when she was told she had to start doing more computer work. Several years ago she told one supervisor, "Oh Marge, I don't know if I can do scanning." The reply: " 'Sure you can.' "
It has been a good life and she has no plans to leave Merchants. She used to love the elegant company Christmas parties with flaming cherries jubilee and an orchestra at the Statler Hotel. She remembers eating soup and crackers during the three days of being stuck in the office during the Blizzard of '77. One of her best days was when she got the presents, flowers and plaque at her 50th anniversary celebrated with public praise at an insurance trade show luncheon. After that Pfieffer, who never married and doesn't drive, bought her first house. She knows there are people who switch jobs to make more money. She wishes them well. "They work a little bit harder," she said. "I'm happy with what I have."